Don’t believe anyone who says your ELV (end of life vehicle) isn’t worth a penny – every ELV is worth something, even if it is only the scrap value. But how can you make sure that you squeeze every last bit of value out of a clapped out Chrysler, a flat-lined Fiat or a Renault with rigor mortis? Easy! By following these 7 steps to getting the best possible price for your scrap car. 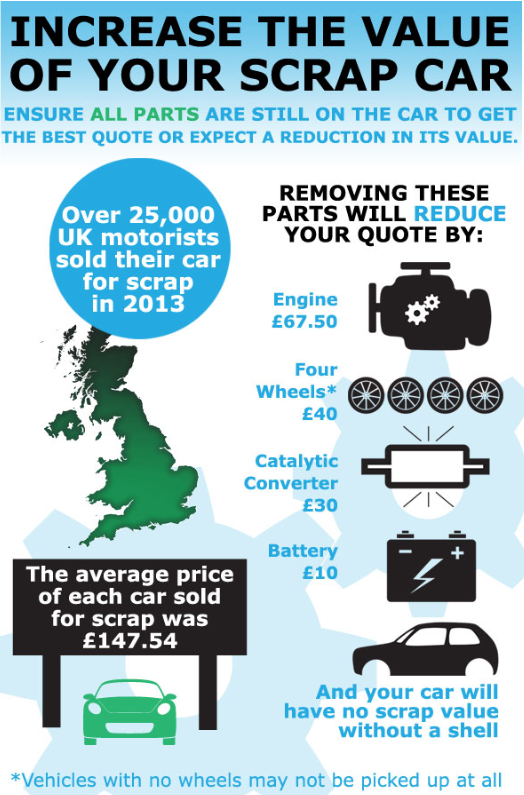 Certain Scrap dealers have been known to reduce the prices they offer towards the end of each month. This is not some elaborate conspiracy to wheedle a bit of extra profit when the bills roll in – it’s just a common way of managing the workload. It’s quite common for dealers to be fully booked, or close to fully booked, at the end of the month, and so they reduce their offers to become less competitive (temporarily). This helps to stop them from over-committing to customers. If you do your research early in the month, you can get a guaranteed quote at a time when prices may be at their most competitive. To avoid disappointment, you could also book your car in for collection in a few weeks’ time (if you don’t mind waiting). You can find useful hints and tips on researching scrap car companies here. Taking parts from your car is going to lower its value and could put a lot of companies off too. Removing some parts can also make it difficult to collect your car – have you tried to load a car without wheels onto a recovery vehicle? The more parts you can leave on the ELV, the more it is worth to a dealer. But you didn’t really need us to tell you that, did you? The biggest problem with selling your ELV over the Internet is that the scrap car companies don’t really have enough information to work with. To value your car, they are pretty much restricted to relying on its make and age and its estimated weight (based on age and make). That’s just how the business operates – we have to cover the worst case scenario when we value a car, otherwise we would be out of business before you had chance to clear out your glove box. The last thing you want is to agree a price for your ELV and then have to haggle with a burly driver when they come to collect. Unfortunately, this type of thing has happened a lot in our industry in the past, and still occurs with some companies today. So if you find a price you are happy with, make sure it is a guaranteed price and that you describe the condition of your ELV as accurately as possible. Remove My Car were one of the first companies to offer guaranteed prices that we actually stuck to. We understand that you don’t want the hassle of haggling over price and that it can be quite intimidating for some people, so we just don’t do it. As long as your description is accurate, we will give you the price we agreed online. No arguments, no fuss, just an easy and pleasant transaction. Before your ELV is collected, make sure you remove the tax disc and send it to DVLA for a refund. It is better if you can do this before the end of a month, otherwise they will not include the next month in your refund. If a company claims that their value includes the tax disc, deal with somebody else. The tax disc should never be part of the value of an ELV. Remember, it is important that you take the tax disc out of your car before it is collected. If you forget, and the car is scrapped, it is going to cost you time and money to get a replacement. If a company try to reduce their price by £25 because you don’t have the V5C (log book), put on an American accent and tell them to “take a hike”. The £25 log book trick is a well-known ploy, which we have covered here Sneaky Tricks of the Scrap Car Industry DVLA don’t require the log book for scrapped cars, although it does make things easier. Some scrap car companies won’t collect an ELV without a log book. That’s old-school practice, and completely unnecessary now that we have the ID rules that came into place with the cash ban. But you may still run into it. Ultimately, it is their choice what vehicles they will accept. At Remove My Car, we will collect your ELV without a log book and we will never try to knock £25 off the quoted price. Some areas are more competitive than others. So if you are lucky to live in Liverpool, Swindon, or any of the areas we mention in our Top 10, you’ll be quids in. Vehicle recycling specialist Remove My Car has had its ELV recycling target service recognised by the Government’s Department for Business, Innovation and Skills (BIS). Yet again theres been further drops in metal prices, it's now the lowest in 6 years since the last crash in 2008/2009. Slowing economic growth in China is the biggest contribution for the fall in demand and its not looking to increase anytime soon! Its now been confirmed as part of the government’s Red Tape Challenge initiative to remove unnecessary burden by Ministers, from 8 June 2015 DVLA will no longer be issuing the paper counterpart to the photocard driving licence. Existing paper counterparts will be no longer valid and drivers are advised to destroy their counterpart after 8th June 2015. February 2016 Metal prices are significantly lower than any period within the past 6 years. Prices on average are £30 Per Tonne for light Iron. Lowest being around £20 Per Tonne and the highest being around £40 Per Tonne.